Hanoi (VNA) – About 492,000kWh of electricity, equivalent to 917 million VND (over 39,500 USD), was saved in Vietnam during the Earth Hour, when lights were turned off for one hour from 8:30pm on March 30. According to the National Load Dispatch Centre, the saved power this year was higher than that during the same event in 2018, which saved 485,000kWh – equivalent to 834 million VND. 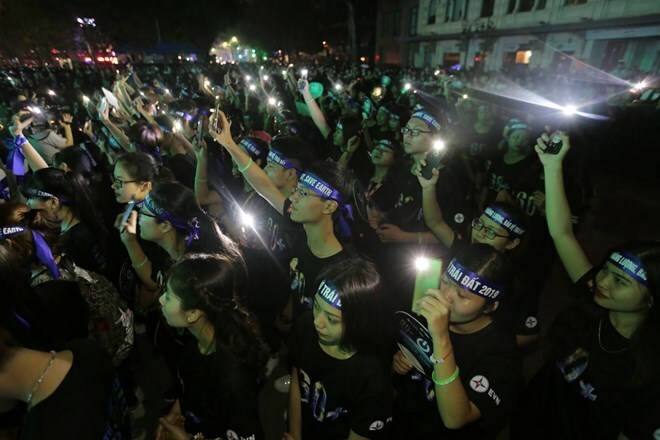 At a light-turning off ceremony in Hanoi on March 30 evening, Vice President Dang Thi Ngoc Thinh said the Earth Hour events, held in Vietnam for 11 years so far, affirmed the country’s resolve to protect the environment and respond to climate change. The 2019 Earth Hour called on all people and businesses to join hands in saving energy to protect energy resources and the environment, she said, expressing her hope that the campaign would attract more attention from authorities, people and the business community who should turn off lights and unnecessary devices whenever they could to save energy. The Earth Hour was initiated by the World Wildlife Fund, aiming to raise public awareness of climate change and energy saving. About 7,000 cities and billions of people in 187 countries and territories around the world have joined in this campaign.